CIMFR Certificate will be provided. Brass bush is provided with the FLP enclosure. Double compression flame proof cable gland is provided with enclosure. Enclosure is provided with eye-bolt for easy shifting. Function is to bring to stop, moving / rotating machinery like motor / gearbox. Holds / stops the load in desired place. Instant stop. Used in hazardous locations where concentrations of flammable gases, vapors, or dusts occur. Flame proof weather proof (FLP / WP) enclosures are constructed in accordance with provisions as specified in IS / IEC : 60079-1 : 2007 ; suitable for II B and Zone I & II atmosphere. Failsafe AC or DC disc brakes are fitted inside these enclosures. Very compact and modern in design. 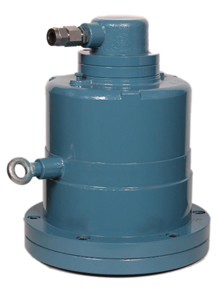 The mounting flange of the enclosure is mounted on the non driving end of the motor. There are 3 types of enclosures : Small, Medium and Big depending upon the size and torque capacity of the brake. Detailed drawings of all 3 types are provided for your reference. Pethe Industrial Marketing Company Pvt. Ltd. is the leading manufacturer of flame proof brake in India. Pethe Industrial is the leading supplier of flame proof electromagnetic brakes in Mumbai, Maharashtra, Gujarat, Delhi, and all over India.